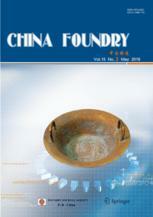 Abstract: In this work, some important factors such as ceramic shell strength, heat preservation temperature, standing time and withdrawal rate, which influence the formability of directionally solidified large-size blades of heavy-duty gas turbine with the liquid metal cooling (LMC) process, were studied through the method of microstructure analysis combining. The results show that the ceramic shell with medium strength (the high temperature flexural strength is 8 MPa, the flexural strength after thermal shock resistance is 12 MPa and the residual flexural strength is 20 MPa) can prevent the rupture and runout of the blade. The appropriate temperature (1,520 °C for upper region and 1,500 °C for lower region) of the heating furnace can eliminate the wide-angle grain boundary, the deviation of grain and the run-out caused by the shell crack. The holding time after pouring (3-5 min) can promote the growth of competitive grains and avoid a great deviation of columnar grains along the crystal orientation <001>, resulting in a straight and uniform grain structure. In addition, to avoid the formation of wrinkles and to ensure a smooth blade surface, the withdrawal rate should be no greater than the growth rate of grain. It is also found that the dendritic space of the blade decreases with the rise of solidification rate, and increases with the enlarging distance between the solidification position and the chill plate. Abstract: The content and kind of trace elements in magnesium alloys have important effects on their ascast and semi-solid microstructures. In this research work, effects of trace Cr on as-cast and semi-solid microstructures of ZC61 magnesium alloy were investigated by metal mold casting and semi-solid isothermal heat treatment. The results show that the addition of Cr can refine the α-Mg phase without generating a new phase, noticeably change the eutectic phase, and decrease the average size of solid particles at the same isothermal heat treatment conditions. Non-dendritic microstructures of all alloys are constituted of α1-Mg phases, α2-Mg phases and eutectic phases after water quenching. With isothermal temperature increased or holding time prolonged, the eutectic microstructure (α-Mg+MgZn2+CuMgZn) at the grain boundaries in as-cast alloy is melted preferentially and then turned into semi-solid non-dendritic microstructure by processes of initial coarsening, microstructure separation, spheroidizing and final coarsening. Especially when the ZC61-0.1Cr alloy was treated at 585 °C for 30 min, the ideal non-dendritic microstructure can be obtained, and the corresponding solid particle size and shape factor were 37.5 μm and 1.33, respectively. The coarsening process of solid α-Mg phase at higher temperature or longer time, which is affected by both combining growth and Ostwald ripening mechanism, is refrained when Cr is added to the ZC61 alloy. Abstract: Since the USA patent of electroslag remelting (ESR) metallurgy was held by P. K. Hopkins in 1940, the ESR technology has now entered a relatively mature stage after a 70-year history of development. At present, the annual capacity of ESR steels around the world is approximately 2 million tonnes. ESR metallurgy emerged in China in 1958. Since then, electroslag furnaces were gradually installed in Chinese special steel plants. At present, there are more than 200 electroslag remelting furnaces in the metallurgical workshops of these steel plants with an annual production capacity of about 500,000 tonnes of ingots and components made of about 200 varieties of steels, including high quality steels and superalloys. This ESR technology is used as a special remelting and refining method for producing high quality steels and superalloys. However, traditional ESR technology has the disadvantages of environmental pollution and extremely high specific power consumption. High power consumption restricts, to a certain degree, the competitiveness of ESR steels in the marketplace. The measures of power saving in ESR have been researched in recent years. In this paper, some factors influencing power consumption, such as filling ratio, slag system, slag amount, melting rate and furnace structure are reviewed, and several new ESR technologies for power saving are proposed. Abstract: The influences of different directional solidification processes, i.e., the high rate solidification (HRS) and liquid metal cooling (LMC), on microstructure and stress rupture property of DD488 alloy were investigated. The DD488 alloy was directional solidified by both HRS and LMC processes. The microstructure and stress rupture properties at 980 ºC/250 MPa were investigated by using optical microscopy (OM), scanning electron microscopy (SEM), electron microprobe analyzer (EPMA), transmission electron microscopy (TEM) and stress rupture testing. The results indicated that the LMC process refined the primary dendrite arm and decreased the microporosity volume fraction and solidification segregations of Cr and Co in as-cast DD488 alloy. After standard heat treatment of 1,260 ºC/4 h, AC (air cooling) + 1,080 ºC/4 h, AC + 870 ºC/24 h, AC, the γ′ morphology in LMC alloy was more cuboidal than that in HRS alloy, and the γ′ volume fraction of LMC alloy was higher than that of HRS alloy. The stress rupture life at 980 ºC/250 MPa of HRS alloy was 76.8 h, and it increased to 110.0 h in LMC alloy. The LMC process increased the stress rupture life due to the higher γ′ volume fraction, more perfect rafting structure and finer interfacial dislocation networks. Abstract: G-NiCr28W is a nickel-based cast alloy. Its microstructure consists of nickel-rich matrix phase and chromium-rich eutectic carbides. The solution treatment process can provide homogenous microstructure and desired mechanical/thermal properties for G-NiCr28W alloy. However, the solution treatment process affects the corrosion resistance of the alloy and it causes metal loss due to the occurrence of oxidation at atmospheric conditions. Therefore, determining the changes in the properties of the G-NiCr28W is important. For this purpose, G-NiCr28W specimens were solution treated at 1,040 ˚C, 1,100 ˚C and 1,160 ˚C for 1 h and 8 h, respectively. The microstructures of the solution-treated samples were characterized by optical microscopy, scanning electron microscopy, energy dispersive spectroscopy and X-ray diffraction analysis. Moreover, hardness, corrosion resistance and oxidation behaviors of the solution-treated samples were examined. The solution treatment process applied at 1,160 ˚C led to the formation of Fe2W2C blocky carbides, and hardness of the sample increased with the existence of blocky carbides, while corrosion resistance decreased. Furthermore, excessive metal loss occurred depending on oxidation due to the high process temperature at 1,160 ˚C. Abstract: Interfacial dislocations found in single crystal superalloys after long term thermal aging have an important effect on mechanical properties. Long term thermal aging tests for DD5 single crystal superalloy were carried out at 1,100 °C for 20, 100, 200, 500 and 1000 h, and then cooled by air. The effect of long term thermal aging on the dislocation networks at the γ/γ' interfaces was investigated by FE-SEM. Results showed that during the long term thermal aging at 1,100 °C, misfit dislocations formed firstly and then reorientation in the (001) interfacial planes occurred. Different types of square or rectangular dislocation network form by dislocation reaction. Square dislocation networks consisting of four groups of dislocations can transform into octagonal dislocation networks, and then form another square dislocation network by dislocation reaction. Rectangular dislocation networks can also transform into hexagonal dislocation networks. The interfacial dislocation networks promote the γ' phase rafting process. The dislocation networks spacings become smaller and smaller, leading to the effective lattice misfit increasing from −0.10% to −0.32%. Abstract: The development of magnesium alloys was limited due to the low absolute strength and poor corrosion resistance. It was found that the optimal performance could not be achieved in some alloys by a single quenching and aging treatment, but could be achieved after a graded aging or multiple-stage aging heat treatment. The Mg97Zn1Y2 alloy was prepared and subjected to single and double aging treatments. Single aging was carried out at 250 ºC for 6 to 15 h. For double aging, the first step was performed the same as the single aging. The second step was performed at 350 ºC for 12 h. The microstructure and properties of the alloy with single and double aging were analyzed by means of hardness measurement, optical microscopy, scanning electron microscopy, X-ray diffraction, and polarization curve measurements. Results show that the precipitated nanoscale phases are formed during aging, and evenly distributed in the matrix. Compared with the single aging treatment, the hardness and corrosion resistance of the alloy are further improved due to the double aging treatment. Abstract: Appropriate vibration can promote the feeding capacity of gravity casting, but the effect of vibration on the feeding of low-pressure casting is not clear. The effect of vibration on the seepage feeding of ZL205A alloy was investigated by vibration casting experiment and physical simulation. The aqueous solution of sodium carboxymethyl cellulose (CMC) with the same rheological characteristic of metal melt was used. The results show that vibration can improve the feeding capacity and reduce shrinkage defects of ZL205A alloy in lowpressure casting. The orthogonal physical simulation experiments indicate that vibration with low frequency and great exerted force can significantly improve the seepage velocity of non-Newtonian fluid with solid particles in porous medium. The seepage phenomenon in CMC solution shows that vibration can change the structure of accumulated particles at the seepage entrance, and thus open the blocked feeding channel. The numerical simulation of one-dimensional semisolid fluid seepage reveals that vibration can form a wave field in the porous medium, which can reduce the adhesion force between fluid and capillary wall and destroy the boundary layer of fluid, and thus promote the seepage velocity. Abstract: The semisolid slurry of Al-Zn-Mg-Cu alloy was prepared through a self-designed water-cooled copper serpentine pouring channel (WSPC) machine. Influences of pouring temperature, the number of turns and the cooling water flow rate on the microstructure of the semisolid Al-Zn-Mg-Cu alloy slurry were investigated. The results show that the semisolid Al-Zn-Mg-Cu alloy slurry with satisfactory quality can be generated by the WSPC when the pouring temperature is in the range between 680 ºC and 700 ºC. At a given pouring temperature, the average grain size of primary α-Al decreases and the shape factor increases with the increase of the number of turns. When the cooling water flow rate is 450 L·h-1, the obtained semisolid slurry is optimal. During the preparation of the semisolid Al-Zn-Mg-Cu alloy slurry with low superheat pouring, the alloy melt has mixed inhibition and convection flow characteristics by “self-stirring”. When the alloy melt flows through the serpentine channel, the chilling effect of the inner wall of the channel, the convection and mixed inhibition of the alloy melt greatly promote the heterogeneous nucleation and grain segregation. This effect destroys the dendrite growth mode under traditional solidification conditions, and the primary nuclei gradually evolve into spherical or nearspherical grains. Abstract: The microstructure, fracture morphology and mechanical properties of Al-10Si alloy modified with Al-5Ti were analyzed and tested by optical microscopy, scanning electron microscopy, and universal electronic testing machine. Compared with unmodified Al-10Si alloy, the area fraction of α-Al phase in Al-10Si alloy modified at 740 °C increased first and then decreased with the increase of added amounts of Al-5Ti, and reached the maximum when the added amount of Al-5Ti was 0.5wt.%. When the modification temperature increased from 700 to 740 °C with Al-5Ti being fixed at 0.5wt.%, α-Al dendrites were refined obviously and the area fraction remarkably increased. Compared with unmodified Al-10Si alloy, the ultimate tensile strength and elongation of the alloy modified at 740 °C with 0.5wt.% Al-5Ti increased by 9% and 49%, respectively. The fracture surface of modified alloy predominantly exhibited ductile fracture. Abstract: The present research work reports the fabrication and evaluation of the mechanical properties of hybrid aluminium matrix composites (HAMC). Aluminium 7075 (Al7075) alloy was reinforced with particles of boron carbide (B4C) and coconut shell fly ash (CSFA). Al7075 matrix composites were fabricated by stir casting method. The samples of Al7075 HAMC were fabricated with different weight percentages of (0, 3, 6, 9 and 12wt.%) B4C and 3wt.% of CSFA. The mechanical properties discussed in this work are hardness, tensile strength, and impact strength. Hardness of the composites increased 33% by reinforcements of 12wt.% B4C and 3wt.% CSFA in aluminium 7075 alloy. The tensile strength of the composites increased 66% by the addition of 9wt.% B4C and 3wt.% CSFA in aluminium 7075 alloy. Further addition of reinforcements decreased the tensile strength of the composites. Elongation of the composites decreased while increasing B4C and CSFA reinforcements in the matrix. The impact energy of the composites increased up to 2.3 J with 9wt.% B4C and 3wt.% CSFA addition in aluminium alloy. Further addition of reinforcement decreased the impact strength of the composites. The optical micrographs disclosed the homogeneous distribution of reinforcement particles (B4C and CSFA) in Al7075 matrix. The homogeneously distributed B4C and CSFA particles added as reinforcement in the Al7075 alloy contributed to the improvement of hardness, tensile strength, and impact strength of the composites. Abstract: The effect of synergistic action of ultrasonic vibration and solidification pressure on tensile properties of vacuum counter-pressure casting ZL114A alloys was studied systemically through testing and analyzing the tensile strength and elongation subjected to different ultrasonic powers and solidification pressures. The results indicate that the synergistic action of ultrasonic vibration and solidification pressure can result in the refinement of grains and improvement of tensile properties. Both the highest tensile strength and elongation of aluminum alloy were obtained under synergistic action of 600 W ultrasonic power and 350 kPa solidification pressure. Moreover, the tensile fracture morphology shows obvious ductile fracture characteristics. When the solidification pressure is lower than 300 kPa, the effect of ultrasonic power on tensile strength and elongation is more obvious, but when the solidification pressure is higher than 300 kPa, the effect of solidification pressure on tensile strength and elongation is greater. Meanwhile, the size and morphology of the eutectic silicon were improved significantly by the ultrasonic vibration and pressurized solidification. The strip and massive eutectic silicon phase are completely converted into small short rod-like and evenly distributed Si phases at the grain boundary of primary α-Al. Abstract: Differential thermal analysis experiments have been performed on samples machined from Y2-blocks cast with different high-silicon spheroidal graphite irons. Depending on magnesium, silicon, cerium and antimony content, the as-cast microstructure showed various levels of chunky graphite in the central part of the blocks. In contrast, the microstructure of the materials after remelting and resolidification during differential thermal analysis consisted of lamellar or compacted graphite. The formation of chunky graphite in the as-cast microstructure is rationalized using an index or silicon equivalent that has been recently suggested. The differences in the microstructures after differential thermal analysis are discussed in terms of available free magnesium. Emphasis is finally put on the striking differences in characteristic size of the microstructures made of compacted graphite as compared to lamellar graphite and chunky graphite. This leads to tentative conclusions about growth of compacted and chunky graphite which would be worthy of further experimental investigations. Abstract: The pyrolysis behaviors of foam patterns have critical influences on fluid morphology and defect formation in Lost Foam Casting (LFC). The pyrolysis behaviors of expanded polystyrene (EPS) and styrenemethyl methacrylate (St-MMA) foams were compared using synchronous thermal analysis (STA), which was performed under argon atmosphere at different heating rates (from 10 to 40 K•min-1). The degradation heat was calculated by integrating DSC curves. Results show that the calculated degradation heat of St-MMA (605.28 J•g-1) was significantly lower than that of EPS (706.71 J•g-1). Furthermore, the non-isothermal iso-conversional method was used to determine the pyrolysis apparent activation energies of EPS and St-MMA, and results show that the activation energy of St-MMA (200.36 kJ•mol-1) was apparently higher than that of EPS (167.92 kJ•mol-1). These calculated results indicate that the weight loss rate of EPS is greater than St-MMA in the pyrolysis process. In addition, the apparent activation energies at various pyrolysis stages demonstrate that the pyrolysis reactions of EPS and St-MMA may involve physical and chemical changes in the decomposition layer of the LFC process. Abstract: The counter-gravity casting methods have been developed to remove the casting defects of Mg based alloys. However, the effects of different counter-gravity casting methods on the microstructure and mechanical properties have not been studied in detail. ZM5 alloys were prepared by gravity casting, low-pressure casting and counter-pressure casting, respectively. The mechanical properties, microstructure and fracture morphologies were examined and compared by means of optical microscopy, scanning electron microscopy methods and tensile testing. Results show that casting defects such as gas pore, shrinkage porosity and cavity can be eliminated by counter-pressure casting. The grain size of α-Mg is decreased significantly by counterpressure casting. Moreover, the precipitated particles are more uniform and finer in the counter-pressure casting sample. As a result, the mechanical properties of the alloys are greatly improved. The tensile strength and elongation of the samples by counter-pressure casting are 285 MPa and 13.9%, respectively, which are much higher than those of the low pressure casting and gravity casting. Abstract: In this present work, Pb was applied in the Mg97Zn1Y2 alloy to improve its microstructure and properties, using conventional casting methods. The microstructure and properties of the Mg97Zn1Y2 alloy and Mg97Zn1Y2-xPb(x=0.6wt.%, 1.2wt.% and 1.8wt.%) alloys were observed by optical microscopy, scanning electron microscopy method and analyzed by X-ray diffraction, hardness and strength measurement and electrochemical testing. After adding Pb to the Mg97Zn1Y2 alloy, a new particle phase Mg2Pb was identified along the grain boundaries, and dendrites were refined. In addtion, the hardness of Mg97Zn1Y2-xPb(x=0.6wt.%, 1.2wt.% and 1.8wt.%) alloys was higher than that of the Mg97Zn1Y2 alloy; with the increase of Pb content, the hardness of the alloy increased first and then decreased, followed by a final slight increase, and reached a maximum of 89.1 HV when the Pb content was 0.6wt.%. The strength of the alloy increased first and then decreased as the Pb content increased. Moreover, adding a small amount of Pb to the alloy can effectively inhibit corrosion, and Mg97Zn1Y2-0.6wt.%Pb exhibits the best corrosion resistance ability. Abstract: Fluid flow can significantly change the evolution of microstructural morphology. However, relatively little is known how the fluid flow, concentration and microstructure affect each other quantitatively, which is essential to optimize processing parameters. A quantitative simulation study of Al-Cu solidified equiaxed dendrite evolution under forced flow based on phase field - lattice Boltzmann method (PF-LBM) is carried out. Results obtained are validated by Gibbs-Thomson relation at the dendrite tip. Compared with the equiaxed dendrite evolution without flow, the upstream dendrite arm is enhanced while the downstream arm is inhibited. Besides, as the inlet flow rate increases, the secondary arms attached onto the upstream primary arm and the upstream side of the primary arm normal to the inflow velocity has been well developed. Results show that sidewise instabilities of the primary dendrite arm and onset of secondary arm is caused by the local concentration perturbation and will be enhanced or inhabited by the flow. It is believed that the coupled PF-LBM method is able to handle dendrite evolution under forced flow quantitatively, which helps in investigating the solidified dendrite morphology evolution. Abstract: Seventy percent of new product cost is committed in the design phase. Therefore, the cost needs to be minimized. Incorporating accurate cost estimation capabilities into manufacturing processes can help industries to minimize the cost and optimize the design. The casting process has been employed as a key process to manufacture parts having the advantage of low cost and customized products in foundry industry. This paper presents a cost estimation system for the casting process based on the design features, which incorporates the casting information at the design stage of castings. It aims to deliver the best cost-effective choice for casting design features of a product. Two kinds of knowledge, namely economical knowledge (describing the relation between the casting design considerations and the cost) and technical knowledge (involving the material of the casting features) were structured in this research work. On the basis of the minimum product cost, casting material selection can be carried out in detail. The developed system has been validated through an industrial case study. Abstract: High pressure die casting (HPDC) is a kind of near net shape manufacturing method. However, air entrapment in HPDC parts has serious effects upon the casting quality. In order to reduce the air entrapment defects in a AlSi10MnMg alloy thin-wall longitudinal load-bearing beam produced by HPDC, different gating systems were designed and simulated by software Flow-3D to evaluate the entrapped air. Simulation results showed that when the beam is produced by the original designed gating system with a middle ingate, there exist obvious air entrapments in the critical area; the volume of air entrapment was reduced by replacing the middle ingate to an overflow well, and the filling of molten metal became more stable. When the middle ingate was removed for further improvement, the volume of air entrapment was decreased drastically. The parts with glossy surface and good microstructure have been successfully produced by using the final optimized gating system based on simulation results. Abstract: This study aims to consolidate the surface of gray cast iron with aluminum deposition by developing a method that combines the preparation and surface treatment in a single operation. The effect of the wall thickness of the castings on the microstructure of the formed layers was studied, and two thicknesses, 8 mm and 25 mm, were studied. The formation of a continuous and homogeneous rich aluminum layer on the surface of the cast iron was observed. The formed layer is composed of two successive zones identified as two proeutectoid phases FeAl+FeAl/FeAl2 and single-phase FeAl, which significantly increases the surface hardness. Furthermore, this change in surface composition makes it possible to reduce the mass of the immersed samples in a 1 M hydrochloric acid solution during different exposure times (1 to 4 days). Consequently, a clear improvement in the corrosion resistance of the treated layers is highlighted.